The second release for the year and the nineteenth release for the First Spouse Gold Coin series overall will feature Julia Grant. She was the wife of President Ulysses S. Grant. The coins are struck in one half ounce of .9999 fine gold. Julia Dent first met Ulysses S. Grant at her family plantation called White Haven. At the time, he was a West Point cadet and friend of her brother. After several proposals, the two were engaged and married four years later. When her husband commanded the Union forces during the American Civil War, she moved her home to be as close to him as possible. She called her time as First Lady, the happiest period of her life, and entertained often and lavishly. 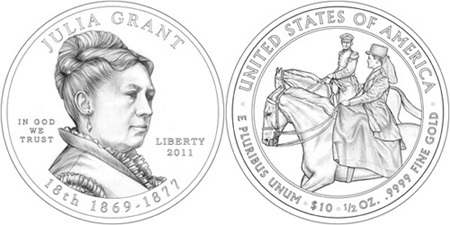 The obverse of the Julia Grant First Spouse Gold Coin features a portrait by Donna Weaver. The inscriptions include “Julia Grant”, “In God We Trust”, “Liberty”, “2011”, “18th”, and “1869-1877″. A scene of the future President and First Lady horseback riding at White Haven is pictured on the reverse. The image was designed by Richard Masters and sculpted by Charles L. Vickers. The surrounding inscriptions include “United States of America”, “E Pluribus Unum”, “$10″, “1/2 oz.” and “.9999 fine gold”. In general issues of the series have a maximum authorized mintage established by the United States Mint. Coins remain available for sale for approximately one year or until the maximum mintage has been sold. Specific details of this release have not yet been announced.